Crédoz took us back to his house, a 300-year-old cement-faced structure with slatted shutters, which he planned to renovate soon and turn into a bed and breakfast. I thought the change a good idea, since the building was a bit homely and seemed hastily built, an appraisal that Crédoz seemed to share. 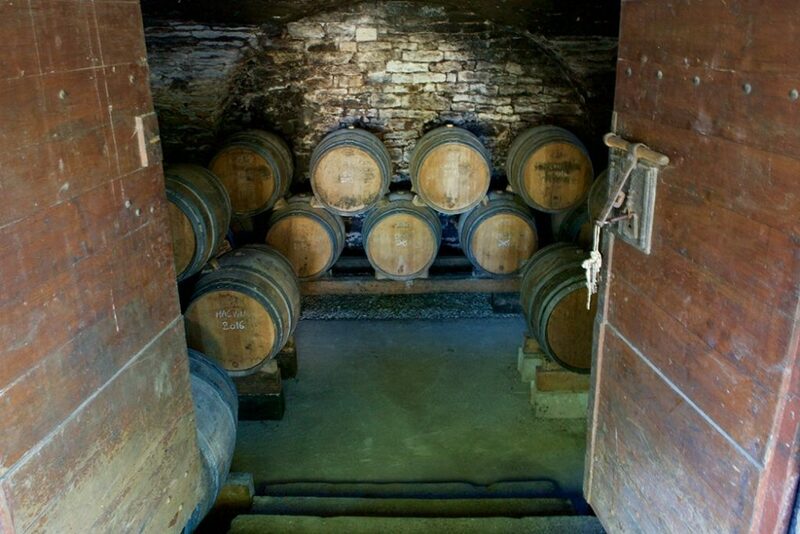 But it stood over the real attraction: the ancient cave underneath, built long before the house, where he now stores his fermenting barrels. The entrance to the cave is through a huge, arched doorway of thick, dark-stained wood with exposed rounded bolts and a lock Crédoz opened with an eight-inch rust-patinated skeleton key. Inside, the walls and domed ceiling are rough and moldy limestone blocks. It all felt eerily like a dungeon in some medieval castle; there’s even one small open window with iron bars on it near the ceiling that look out at ground level, for ventilation. I was in awe of the eerie history of the cramped space, even with its modern uplighting that shines cones onto the walls from the floor. I’ve been to many cellars in California wine country that try and fail to achieve this atmosphere–we in the states just don’t have the antiquity Europeans take for granted. I wasn’t sure I’d ever get used to it and hoped I wouldn’t. Crédoz went into detail about the strict winemaking guidelines of the Château-Chalon AOP. It was review for Ted, but as he translated, I was rapt. Crédoz pulled one of the big wooden corks from the top of a barrel and we looked inside with the help of our iPhone flashlights. The surface of the liquid was covered with a milky, green-gray film. It’s a strangely repulsive sight, yet a key component of the process in making these wines. Vin Jaune is one-hundred percent Savagnin, and it’s done in an oxidative method, continuously exposed to oxygen during and after fermentation. 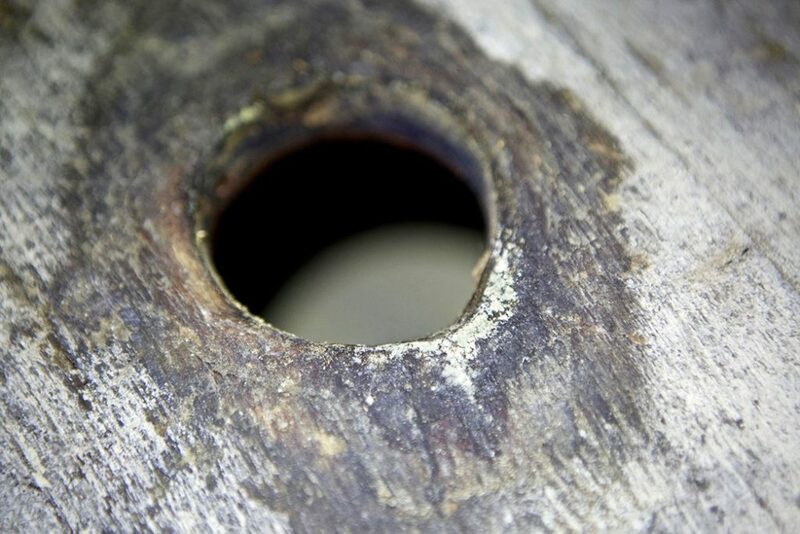 Referred to as “the veil,” that film is a thin layer of yeast that forms over the wine early on in the aging process, protecting it from too much oxidation and imparting a very specific smell and taste. 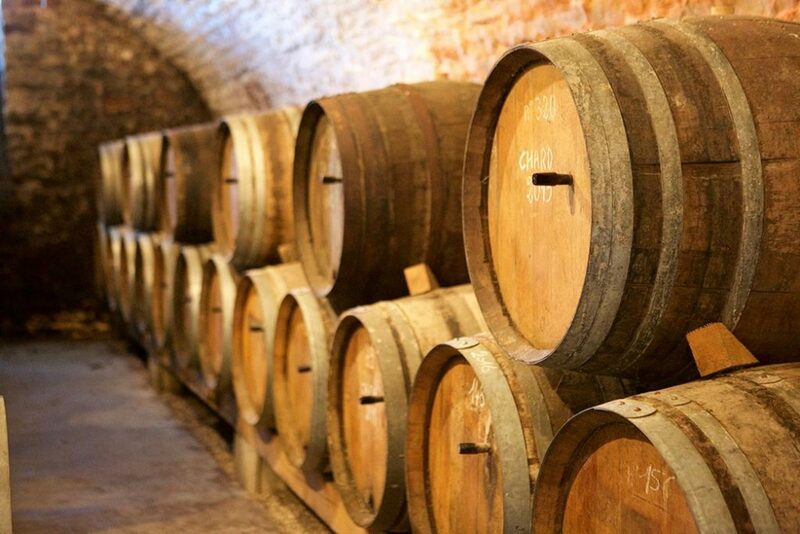 The wine is left alone in barrel as it ages, without a single top-off for the precisely six years and three months required by law. The liquid evaporates over time, which lets in even more air. In the end, so much has evaporated that what was once a liter is reduced to 620 milliliters, just enough to fill the signature squat, bottom-heavy bottles, called clavelins, the size of which was determined by this process. If the wine makes the long journey, Vin Jaunes is one of the most durable wines there is; it can age beyond a hundred years, and younger bottles can be enjoyed many weeks (if you happen to forget about the wine for a while) after being opened. 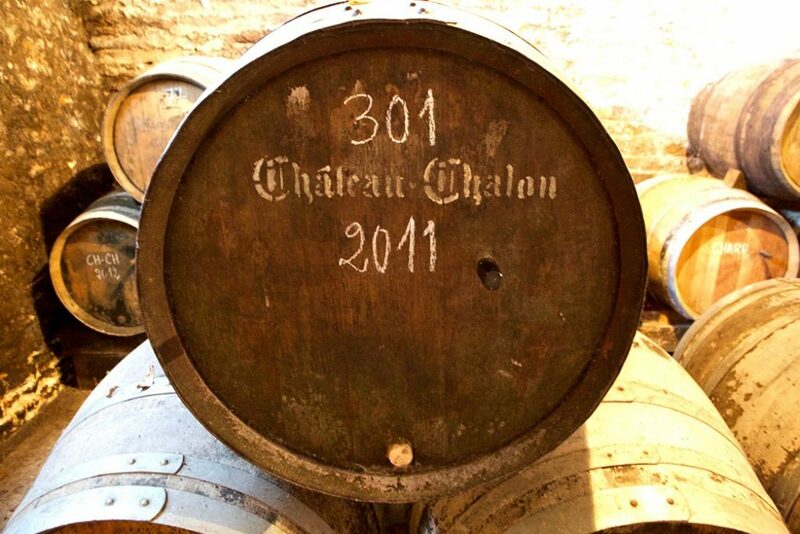 Château-Chalon is one wine where so much is lost during aging that the finished product seems like a bit of a pyrrhic victory, but it is well worth it. We headed to the tasting room, a cozy little space with a bar long enough for just six people. Andrea, Ted and I joined a couple that had driven all the way from Belgium to try the wines and bring back a few cases. They were quite jovial and seemed like they may have been “tasting” for quite a while. Crédoz excused himself to his office for some business and his smiling wife Annie attended to us from behind the bar. She lined up two Chardonnays, a Chardonnay/ Savagnin blend, a Château-Chalon, a sweet wine made from dried grapes (vin de paille), all of which Ted imports. We also sampled a couple more cuvées from a previous vintage. Ted didn’t say anything, just nodded his head in approval; he was already sold. They were all so good that I wanted to hang out long enough to catch up with the Belgians. Annie kept trying to speak English and with every phrase made fun of herself for her mistakes. I told her I actually understood her quite well. She waved me off and did that perfectly French thing where she blew air through expanded cheeks like air escaping a balloon. Each unique wine was more fascinating than the next. After all the talk and built up mystique, I was preoccupied with the Château-Chalon, with its big dry body and scents that I’d never experienced in a wine before. After looping through the other selections, I returned to the Vin Jaune for another splash and pondered its density, a compression of many unfamiliar tastes that I will leave to others to experience for themselves. I definitely understood why Ted was such a fan of Crédoz’s wines. Crédoz was in his office printing a stack of labels for the new vintages and to give Ted a few bottles for the road, one of the great perks of being an importer. After more warm handshakes and waves to him and his wife, we got in the car and pulled away. Then our minds turned quickly to dinner. As with all trips, it seems, the coming days would constantly revolve around where we would find our next meal. 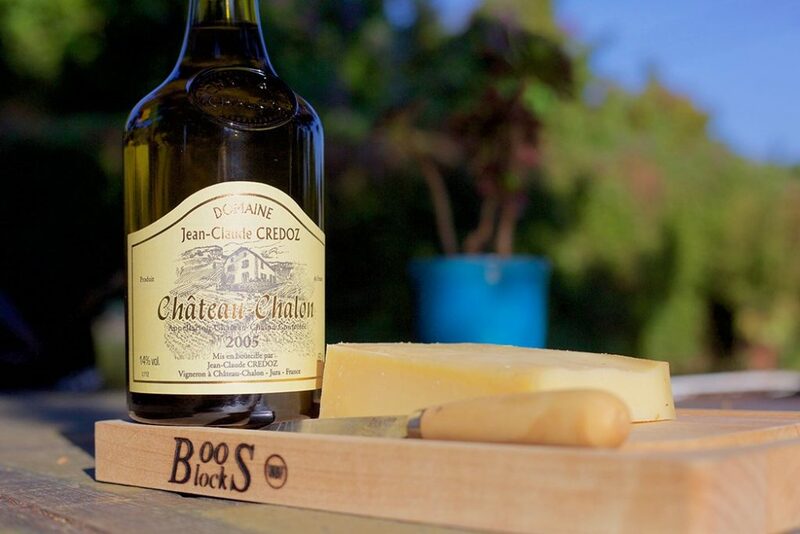 If you’d like to check out some of Crédoz’s wines, go to: The Source Imports.